You may have seen people rushing past you on little scooters these days. They are part of the BirdApp program here in the Grove. 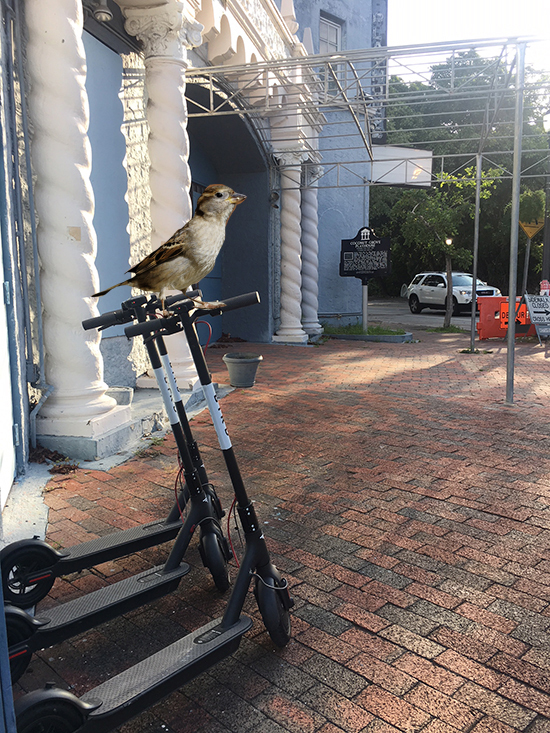 The Bird scooters work closely with the city and hopefully will alleviate our parking problems. They are a bit expensive, so best used for quick runs back and forth. They start off at $1.00 but then the price goes up by .15 per minute. You download the app and then unlock the scooter, they suggest you bring a helmet, but of course that's not going to happen in the real world, is it? After you start it, you're off. You are required to ride in the street and in bike lanes if possible. A drivers license is required to ride and you need to be 18 years old. They ask that you park near bike racks if available and always off to the side. I've spoken with more than one person and the number one concern of people is that riders may just leave the scooters right in the middle of the sidewalk when they are done. You can get paid to charge the scooter, too. Join the charger community and it's easy to do. You find a scooter, pick it up, charge them at home and then release them the next day. Then they will pay you via app the next day. They will call you and ask you questions to see if you would make a good charger. Like, what do you love about the Birds? And what type of car do you have?" Weird things. They pay about $5 per charge, which takes a few hours and costs maybe .15 to charge each scooter. They would love it you could charge three at a time. I have a friend who says they are proliferating. Just the word "bird" reminds him of Alfred Hitchcock's movie, "The Birds." In the movie, Tippi Hedren walks outside and sees one bird, then two, then three, then on and on until there are thousands. 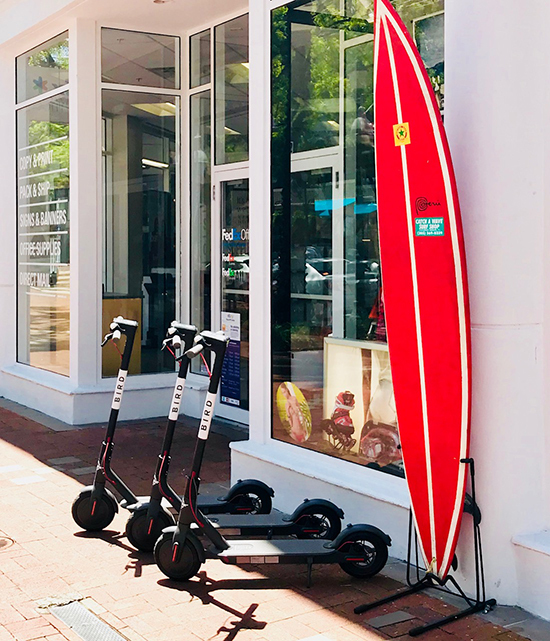 The Bird scooters are in front of CocoWalk and Panther Coffee and Monty's and The Fresh Market and even the Coconut Grove Playhouse! "The electric strangers that scooted into town," as the Today Show calls them. These electric scooters are illegal, as per Florida Statute 316.003(77), and contrary to whoever told you that the company "work(s) closely with the city," has misled you. In fact there is a meeting being held today at City Hall about these electric scooters, because the police consider them a real hazard, on top of the fact that they are illegal. I wrote a story detailing all of this yesterday, and I would urge you and your readers to read it, and the linkage to the Florida Highway Patrol Fact Sheet that includes these scooters. How many days before one of these gets booted? Why not? After NOT burning a few calories walking U can scooter over to Present to pick up a few hundred calories, then to Starbucks for a $14.00 cup of JOE to get a buzz. U mentioned a $1.00 & .15 cents. is that $1.00 an hour? If so that seems reasonable plus it's probably fun. Pretty cool. I like the progress, I'm sure the ambulance chasing attorneys of Miami are ready to pounce on these cases, riders and bystanding pedestrians are bound to have some run ins. Tom, just because something is illegal doesn't mean it should be. The scooters are great for tourists and locals alike. They're a tool, and like any tool, require responsible use. People once thought cars were a menace to society...but we got over that real quick. The scooters are innovation and industry at it's best. Just because some irresponsible ninnies misuse them, doesn't mean we should ban them. Enforcing regulations and responsible use makes more sense than eliminating them.